A worldwide competition for innovation has been won by a teacher running a project in Birmingham which encourages open debate between pupils from different ethnic and religious backgrounds. When a group of pupils approached Mandeep Atwal after a lesson saying they wanted to talk more about race and religion, she knew there was a thirst for open debate about issues of cultural and racial identity. Responding to their request, she set up a discussion group where pupils are free to ask sensitive questions and encouraged to voice their own opinions on world events and issues of race. And so pupils discuss openly topics such as the representation of Muslims in the media, the conflict between India and Pakistan, the cultural mix of their school and why pupils tend to socialise within their own cultural group. "It's a good place to ask questions and someone is there to answer - not a teacher, but another student," says Miss Atwal, head of RE at Shireland Academy, Birmingham. "The moment you see a child is engaged and interested, you know you've got a good idea. I know the children want this, I know they are craving this." The debating group has proved very popular, but Miss Atwal was keen to engage other pupils at Shireland Academy and so she created a website - Young Voices - on the school's intranet. The site gives pupils the chance to showcase their cultural and religious heritage and discuss their experiences and views. For example, one pupil has written and posted a video about her full-immersion Christian baptism, a group of Muslim boys posted a video and discussion about knife crime and a group of African Caribbean boys wrote about the stereotyping of black people in the media. "It's a networking site, but a networking site with a purpose. They're working on specific projects - projects about ethnicity, religion, culture, identity. "Who feels comfortable talking about these things? Well this gives them the chance to do so. "My overall vision for Young Voices is to give students an environment where they feel safe discussing issues that concern them, looking at issues within their own communities." The project has caught pupils imaginations so much that they have also decided to stage live performance to showcase aspects of their own and each others' cultural identities. 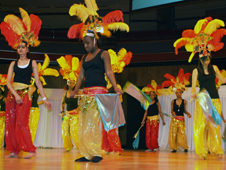 The school's Cultural Fusion Show sees pupils from a range of backgrounds learning and performing Bollywood, South Indian and African dances, as well as street dances and live music. Miss Atwal says the show attracts a wide range pupils, including some of the less engaged, and gets them all mingling. "They're learning skills of team building, collaboration with people they wouldn't normally talk to or work with - it's good for them to talk to people outside of their communities," she says. "The purpose of Young Voices is to bring students together through a project - the Cultural Fusion Show brought students together who didn't normally talk to each other. "It gives them a chance not only to explore other people, but also themselves. Are they identified by their culture or are they identified by themselves?" Kirandeep, 16, says taking part in the Young Voices project has helped her to understand other people's points of view. "It's broadened my knowledge of different cultures. Since this I've been closer to people I came into contact with. We've made a lot of friends. "It's also helped with our RE which I'm doing for GCSE. The debates had a big impact - it was good to get other people's views." 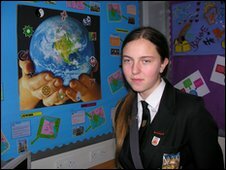 Samantha, 15, says: "It's brought awareness of who lives in the community - there are a lot of different backgrounds. "I don't think a lot of kids have much knowledge of other people's culture so this help them respect each other more. "In RE you learn about religions, but this way you learn about people's families and you see not all people are the same and that some families are stricter." 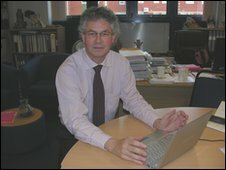 Executive principal at the school, Sir Mark Grundy, says Miss Atwal's work has made a considerable difference in breaking down cultural and ethnic barriers. "We play a role in trying to make our community as cohesive as possible," says Sir Mark. "If the students have all understood each other better, there will be a better atmosphere, they'll be better citizens and are bound to achieve better. "This sort of work will improve attendance and behaviour - and inevitably your standards." 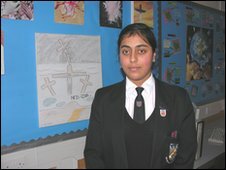 The Young Voices website was considered so successful that Miss Atwal won Microsoft's Worldwide Innovative Teacher Awards in 2009 for "exemplary use of technology". Now she hopes to extend the project beyond her own school. "My vision for Young Voices would be to have it set up in every school in the UK and longer term all over the world," says Miss Atwal. "Young Voices has to be a safe platform where students can ask those questions that they might not be able to ask elsewhere."